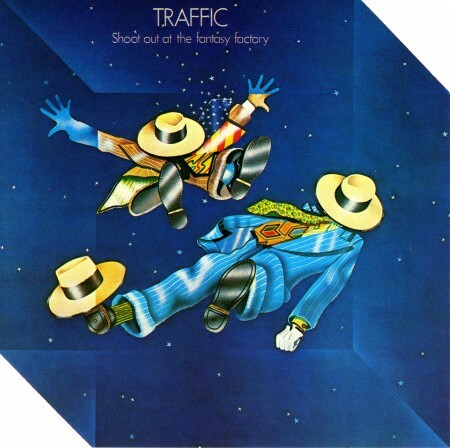 Encouraged by the creative and commercial success of 1971's The Low Spark of High Heeled Boys, Traffic gleefully expanded upon its increasingly eclectic style with Shoot Out at the Fantasy Factory, released in the early days of '73. Steve Winwood, Jim Capaldi and Chris Wood remained, as ever, the core of the band; for these sessions, they were augmented by an American rhythm section, Roger Hawkins (drums) and David Hood (bass). Ghanian percussionist Reebop Kwaku-Bah, who'd been added for the live Welcome to the Canteen and Low Spark, remained in the ranks. In '72, while Winwood recuperated from a bout with peritonitis, Capaldi flew to Muscle Shoals, Alabama, to record his solo album Oh How We Danced. Hawkins and Hood so impressed him during these sessions, Capaldi invited the Americans to come to England to be a part of the ever-evolving Traffic. The Shoot Out At The Fantasy Factory sessions took place at Strawberry Hills Studios in Jamaica, at the suggestion of Island Records chief (and longtime Winwood advisor) Chris Blackwell. A change of environment, it was felt, would nurture the creative element that had steadily brought Traffic to new heights since John Barleycorn Must Die had restored the band to the charts in 1970. Right away, the new aggregation clicked, and the sessions brought five ambitious new songs out of Winwood, Capaldi and Wood. Musically, it melded R&B, pop and jazz in a stylistic gumbo Capaldi, who composed the lyrics, liked to call "Headless Horseman Music." "Shoot Out at the Fantasy Factory," the title song, allows Hawkins, Hood and Reebop to lay down a hypnotic groove while showcasing Winwood's multi-tracked electric guitars, which are joined halfway through by haunting flute from Wood. Winwood's piano and organ set the stage for "Roll Right Stones," with some of the most plaintive singing of his career. Using the English megaliths called standing stones as a starting-off point, he weaves a tale of mythology and doom recalling (in spirit) Traffic's 1970 version of the folk song "John Barleycorn." Wood added both flute and saxophone to this evocative 14-minute track, which climbs to a fever pitch before settling down again. The fine ballad "Evening Blue" follows, with acoustic guitar from Winwood and sax from Wood. With a melancholy mood set by the opening line, "Sitting all alone by the fireside/Listen to the wind in the chimney top," it's perfect for Winwood's shades-of-blue vocal delivery. "Tragic Magic," a Wood composition, is a bluesy instrumental full of fiery improvisation- Wood plays sax, with Winwood on piano, and as it builds toward its crescendo the song is punctuated by the Muscle Shoals horn section. The album closes with "(Sometimes I Feel So) Uninspired," a pensive Capaldi lyric balancing sadness and optimism, leading into a lengthy jam allowing dynamic shading from each othe musicians. Shoot Out At the Fantasy Factory rose to #6 in the American market in March 1973, earning the band a gold album. The expanded, six-member Traffic toured throughout 1973, with many of the dates recorded for a potential live album. That live document of the tour, On The Road, would be released October 1973.